Hey all, this is the second Shredaholic album review from super fast shred master Francesco Fareri. Wow, the speed on this album is unreal, right from the get-go we start off with fast drums, chugging guitars and amazingly fast and clean keyboard playing. 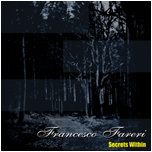 This all builds up tension and eventually the lead guitar comes in, with amazing fast playing, sweep picking galore all in the title track ‘’Secrets Within’’. The album has an overall progressive shred feeling to it with a fair amount of the songs clocking in at least over six minutes long and there is some neat odd time changes here and there adding to the craziness and chaos of the music. I love how the guitar follows the keyboard melodies, really creates a nice contrast over the chugging backing rhythm, it provides quite an intense listen. I also like how in certain parts of the songs the tempo slows down and we get a nice middle 8 from the keyboards, only for a short period before going back into the intense shred guitars, it creates a great effect on the music. Francesco really proves he has great ability on the keyboard/piano as well as on the guitar. Track four ‘’Sonic Garden’’ starts off with nice and calm arpeggios and has a slight phaser esque sound to it. It feels like a little calm breather on the album from all the intense speed, good variety. It doesn’t take long though for the amazingly fast songs to come back. The track ‘’Scenes’’ has some sections of amazing flurries of fast arpeggios, really intense sounding playing. Just like a lot of this CD, this song has some amazingly fast playing and a big progressive metal feel. The guitar tone cuts through very well and has a lot of clarity to its sound, I also really like the keyboard tone, in certain parts it reminds me of old computer games music which is a very good thing! The bass from the great Kyle Honea is intense as well, some real virtuoso playing to be found, there is even a whole track which is just bass instrumental, the song ‘’Present Glow’’ and it is fantastic, the technique shown is very good. Drummer Lucrezio de Seta provides some great drumming on this record, mainly going for the fast and intense approach to his drumming here but handling all the different time changes very well. From tracks 10-15 the album takes a calmer approach, incorporating a big focus on piano/keyboard and also some nice acoustic guitar playing. The track ‘’Parallel Lives’’ is really good, consisting of mainly piano/keyboard playing with a little guitar in the mix of what sounds like an acoustic guitar. The five tracks that follow, as said previously, are also a lot calmer compared to the earlier songs on the CD, and the album ends on a gentle note. 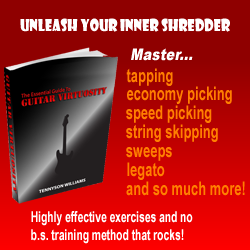 Overall, if you like instrumental guitar shred consisting of fast and relentless, intense playing, and a big progressive vibe then this is definitely for you, a lot of the time the CD is like this, but also has some good variation in which it incorporates some calmer, shorter songs, particularly towards the end of the CD. The technique displayed on this CD is definitely to be noted, as it is fantastic from all the musicians on this CD.